Nelson is the Land Trust's newest preserve. It features a variety of habitats, most notably many large red oaks dotting meadows and towering above hemlock groves. The loop trail offers a varied experience and is an easy-moderate walk for users of all ages. 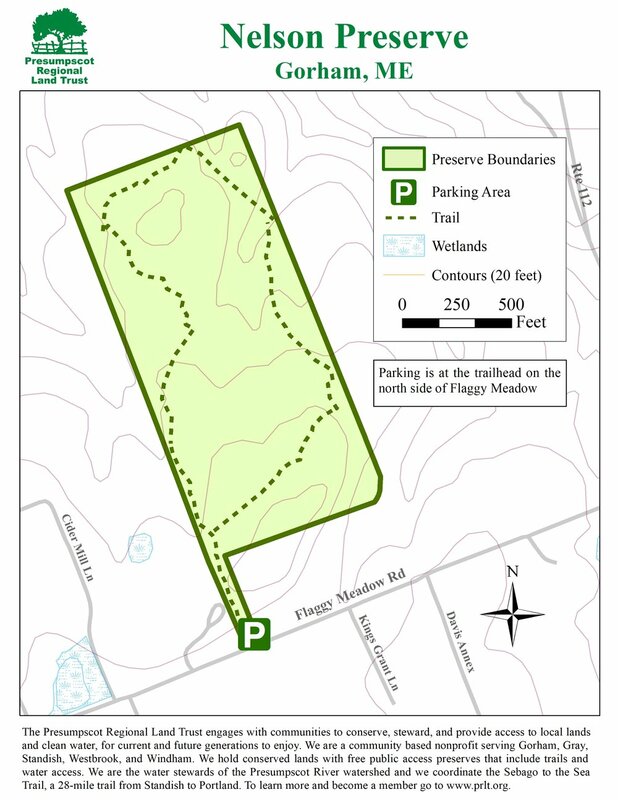 Please see below for the trail map and more information about the preserve and trails. Leave No Trace: Please take out whatever you bring in. Access to the Preserve is from the trailhead on the north side of Flaggy Meadow Road in Gorham. Parking is on the side of the road just after the barn. The trail loops around the preserve, passing through forest, wetlands, and thicket habitat. This is a great place to find edible berries in the summer and is perfect for snowshoeing in the winter. Nelson Preserve is owned in fee by the Presumpscot Regional Land Trust, donated by the late Jane Nelson.